HISTORY: Car 3089 was built by Budd for the Atchison, Topeka and Santa Fe Railway (ATSF) as part of Lot #977, an order for 30 52-seat coaches made in February of 1937, and delivered between July and October 1937. The cars were originally assigned to the Scout but later were assigned to trains such as the San Diegan, Golden Gate, Kansas Cityan/Chicagoan, Tulsan, and El Capitan. In 1969, the car was sold to the New Jersey DOT and rebuilt as an 82 seat commuter coach #3089. The car was often used on routes of the former Central Railroad of New Jersey (CNJ). In 1989, the car was sold to the Green Mountain Railroad. 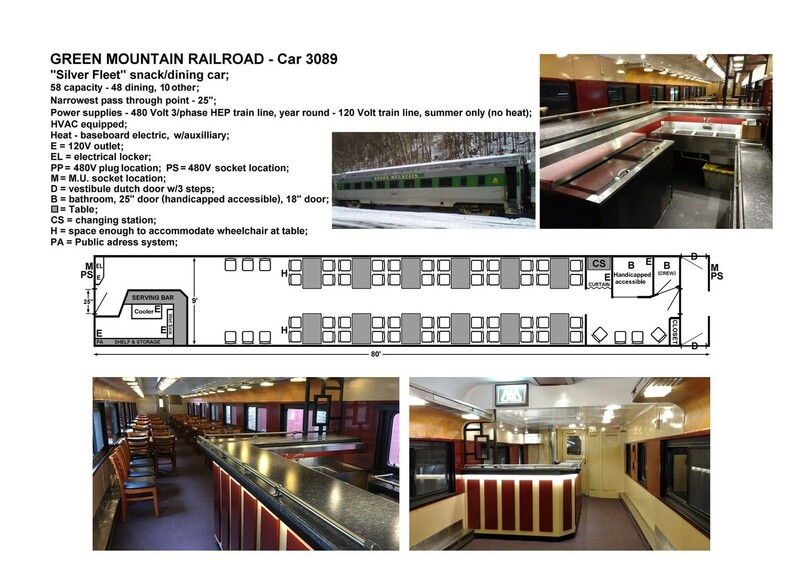 The car has since been rebuilt into a 48-seat dining car with a bar on one end. HISTORY: Car 3074 was built by Budd for the Atchison, Topeka and Santa Fe Railway (ATSF) as part of Lot #977, an order for 30 52-seat coaches made in February of 1937, and delivered between July and October 1937. The cars were originally assigned to the Scout but later were assigned to trains such as the San Diegan, Golden Gate, Kansas Cityan/Chicagoan, Tulsan, and El Capitan. In 1969, the car was sold to the New Jersey DOT and rebuilt as an 82 seat commuter coach #3074. The car was often used on routes of the former Central Railroad of New Jersey (CNJ). In 1989, the car was sold to the Green Mountain Railroad. 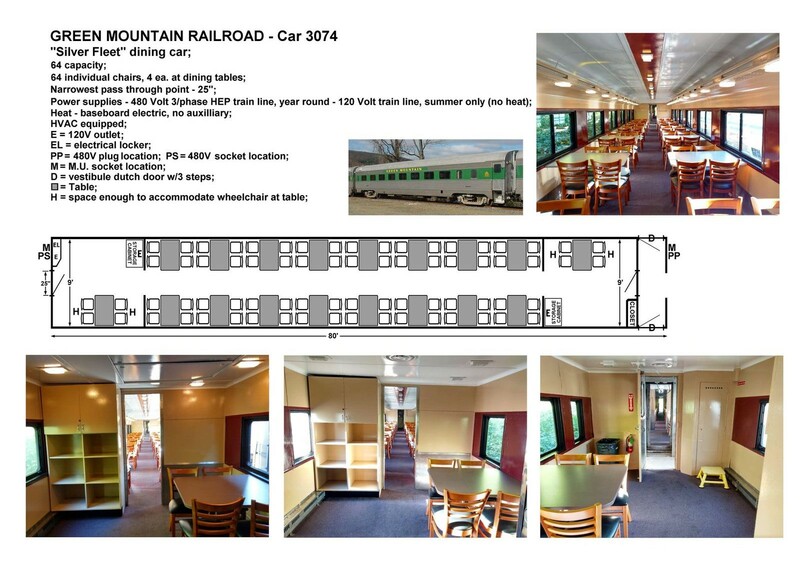 The car has since been rebuilt into a 64-seat dining car. HISTORY: Car 3101 has a unique history, different from the other ATSF cars. While it was built as part of the same order, it was sold to Penn Central in 1970 and converted to an 84 seat commuter coach #2403. Later it went to Jew Jersey Transit before being sold to the Green Mountain Railroad as car #3101. 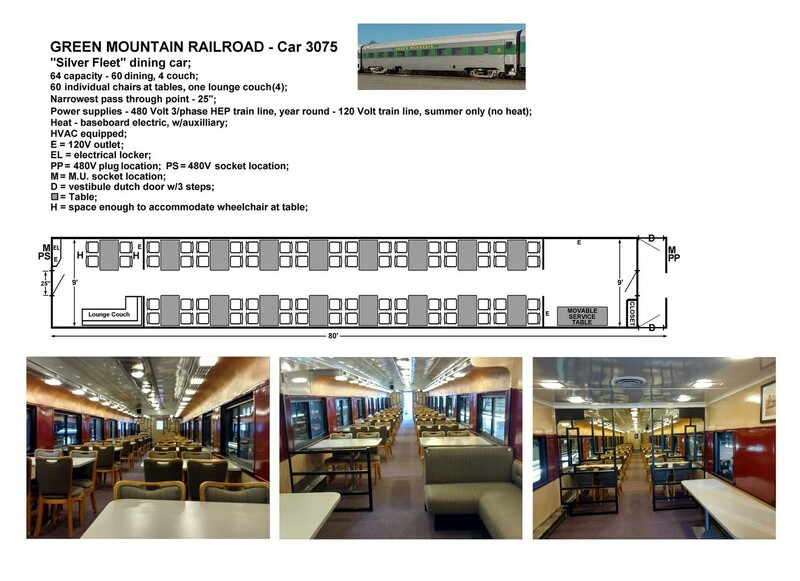 It has since been rebuilt into a 68-seat table car with a small lounge area on one end. HISTORY: Car 3075 was built by Budd for the Atchison, Topeka and Santa Fe Railway (ATSF) as part of Lot #977, an order for 30 52-seat coaches made in February of 1937, and delivered between July and October 1937. The cars were originally assigned to the Scout but later were assigned to trains such as the San Diegan, Golden Gate, Kansas Cityan/Chicagoan, Tulsan, and El Capitan. In 1969, the car was sold to the New Jersey DOT and rebuilt as an 82 seat commuter coach #3075. The car was often used on routes of the former Central Railroad of New Jersey (CNJ). In 1989, the car was sold to the Green Mountain Railroad. 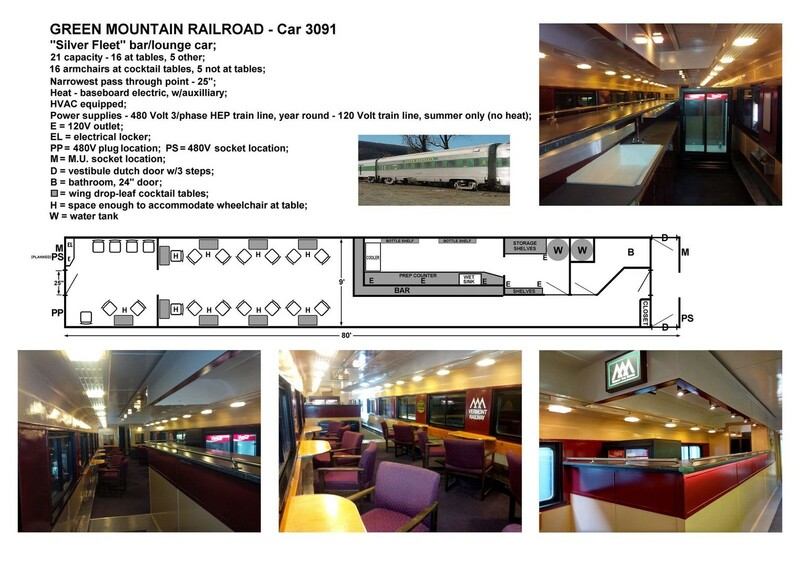 The car has since been rebuilt into a 60-seat dining car. HISTORY: Car 3091 was built by Budd for the Atchison, Topeka and Santa Fe Railway (ATSF) as part of Lot #977, an order for 30 52-seat coaches made in February of 1937, and delivered between July and October 1937. The cars were initially assigned to the Scout but later were assigned to trains such as the San Diegan, Golden Gate, Kansas Cityan/Chicagoan, Tulsan, and El Capitan. In 1969, the car was sold to the New Jersey DOT and rebuilt as an 82 seat commuter coach #3075. The car was used on the Erie Lackawanna routes. In 1989, the car was sold to the Green Mountain Railroad. The car has since been rebuilt into a 21-seat lounge car with a large bar on one end. 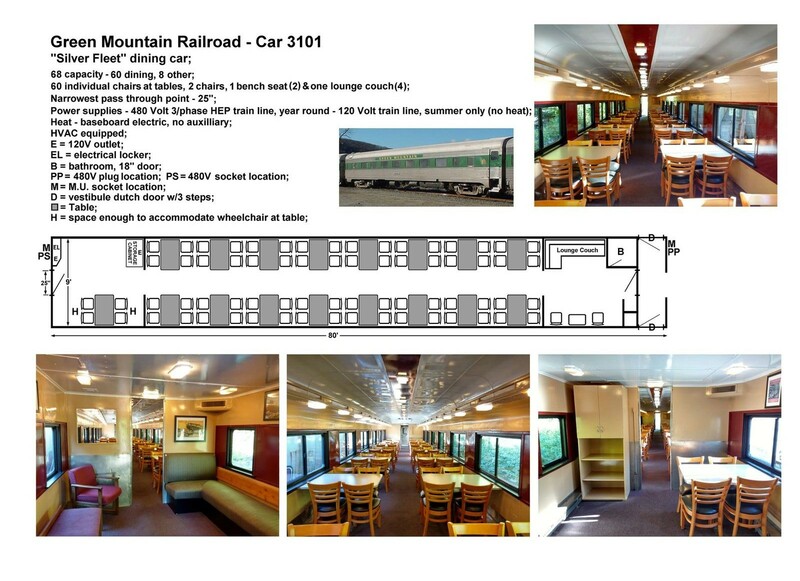 A special thank you to Barton Jennings with the National Railway Historical Society, Inc. for providing us with the historical text of each rail car.